Are you new to yoga?? If so, you have come to the right place! I specialize in introducing yoga to beginners. If you are new to yoga I recommend coming in for a private yoga session before you attend a group class. This is important in order to get basic knowledge that will ease any anxiety, prepare you for the new concepts you will be learning, and teach you how to practice safely. Many of my students continue to practice with me regularly in a private setting to work on technique and to progress their private practice. Please contact me with any questions you have! I look forward to serving you! Shanell specializes in Private Yoga, specifically using the Techniques of Thai Yoga Bodywork to facilitate in the healing of the body and mind. Private sessions either at a studio or your home are available. Bound for Bliss Natural Bodycare Products were created to offer pure and natural “food” for the skin and hair. Every ingredient in these products are all-natural, organic when available, and beneficial to the health and beauty of YOU! Shop with Bound for Bliss’s Etsy shop for Essential Oil Blends, Dosha Balancing Oils, and Detox Bath Salts. Click on pic to shop Bound for Bliss! In Japanese, Reiki has been translated to mean the “universal life force.” Shanell is a Reiki practitioner, who is attuned to tap into and channel this energy in order to activate the body’s natural healing abilities. Reiki is an ancient healing practice working with prana, also known as life force, or qi (chi). 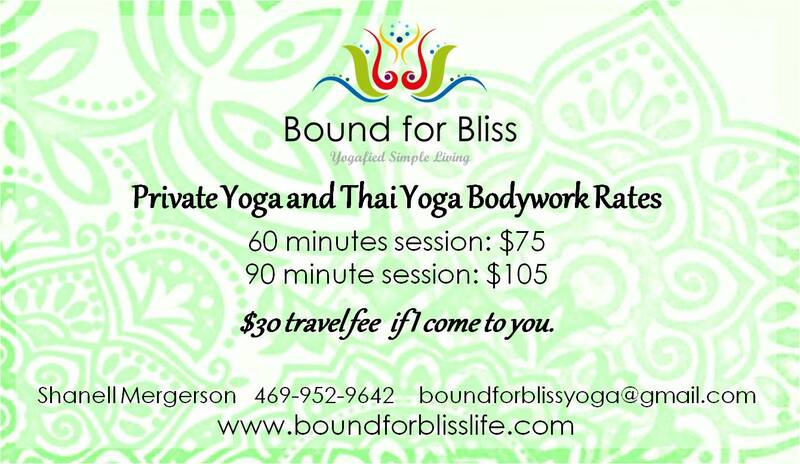 These Reiki Sessions can be done alone, or combined with Private or Thai Yoga Bodywork Sessions.boundforblissyoga@gmail.com or 469-952-9642 to set up an appointment.